Brand is a one of the most valuable asset of any business. How is your brand performing? If you investing your money in brand growth and have a measurable results or you wasting significant funds? With Brand Evaluation Balanced Scorecard you will be able to answer these questions; you will make the process of branding more measurable and controllable. Brand Balanced Scorecard will give an overview over such branding metrics as Brand strength, Relevance, Credibility, Customer preference, Lifetime value, Revenue generation capabilities, brand added value. Building a powerful brand is already half of success in business that exists today. Strong brands always have loyal customers. It is rather helpful to be aware of efficiency of brand investments and their impact on other KPIs. Brand recognition and perception are the two important metrics units to be evaluated. Download trial version of Branding Metrics. Purchase full version of Branding Metrics + bonus. A number of organizations rely on brand recognition for building customer loyalty. This makes 'brand evaluation' an important exercise that has to be carried out on regular basis. This is to judge the effectiveness of brand in contributing to the customer base expansion. Brand evaluation is a significant component of brand management, with the latter revolving around sustaining the power of brand. Ideally speaking, brand is any sign, symbol, name or design that can be tagged as 'ownership label'. People are able to distinguish a given product or service from the other similar options available in the market with the help of brand. This makes it important to go for brand analysis for maintaining the potential of brand. This act of brand assessment enables the marketers know which kind of marketing campaigns have been paying and which of those have not come up to the expectations. Further, this information can be utilized in giving better shape to those. With the correct implementation of the steps, brand equity can be given a push. 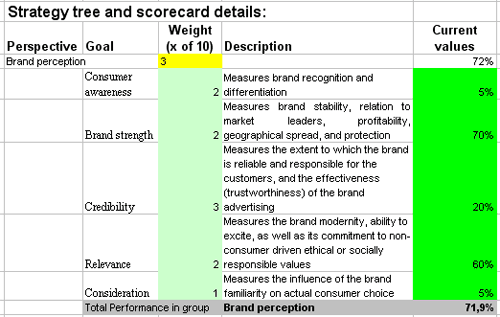 Marketers often utilize brand evaluation scorecard for this purpose in which metrics are collected to mirror the growth being experienced in brand study. .
Related metrics and KPIs for: Web Investment, Marketing, Direct Mail, Content Management, Trade Show, Conference, Word of Mouth Marketing, Exhibitions. Customers who viewed this item also viewed: Business Intelligence Scorecard Metrics Pack | Financial Analysis Scorecards. This is the actual scorecard with Branding Metrics and performance indicators. The performance indicators include: Credibility, Customer preference, Retention, Share of wallet, Lifetime value. Download a trial version of Brand Evaluation Balanced Scorecard or purchase a full version online.